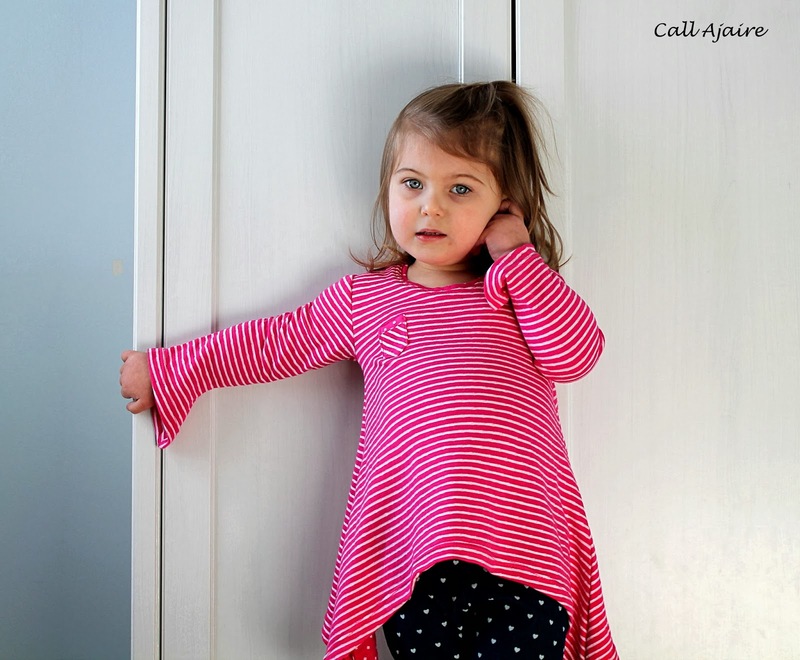 With Kids Clothes Week (KCW) starting on Monday I’ve been pouring through my patterns trying to decide what clothing Bean will need. Long or 3/4 length sleeved shirts are definitely high on the list for the next couple of months and I have a few things in mind. I opted to have the handkerchief hem fall on the seam so that it wouldn’t hang over Bean’s hand as it draped and wouldn’t get caught on things as she runs through the house. 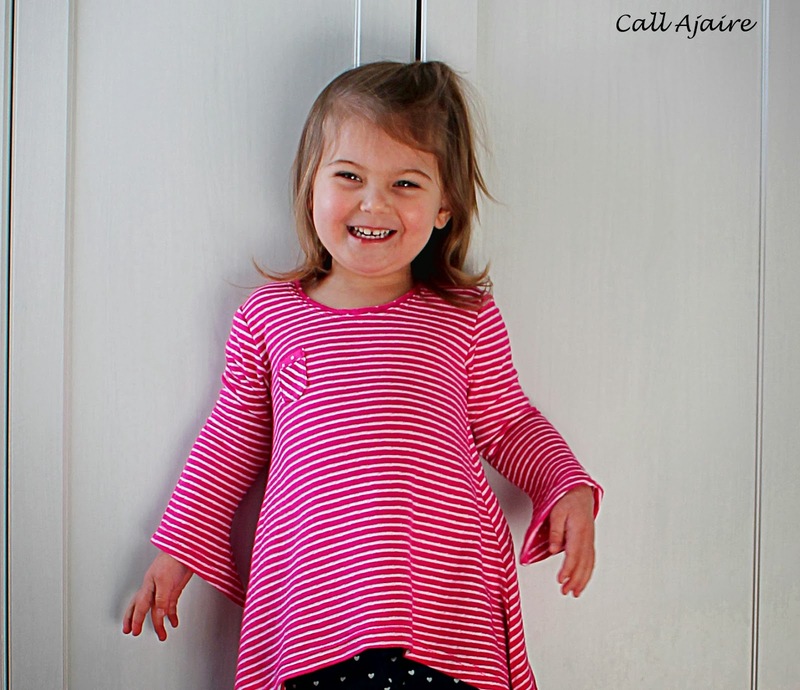 The fabric I used was from my stash, but I bought it at JoAnn fabrics about a year ago. It’s double layer with stripes on one side and polka dots on the other. 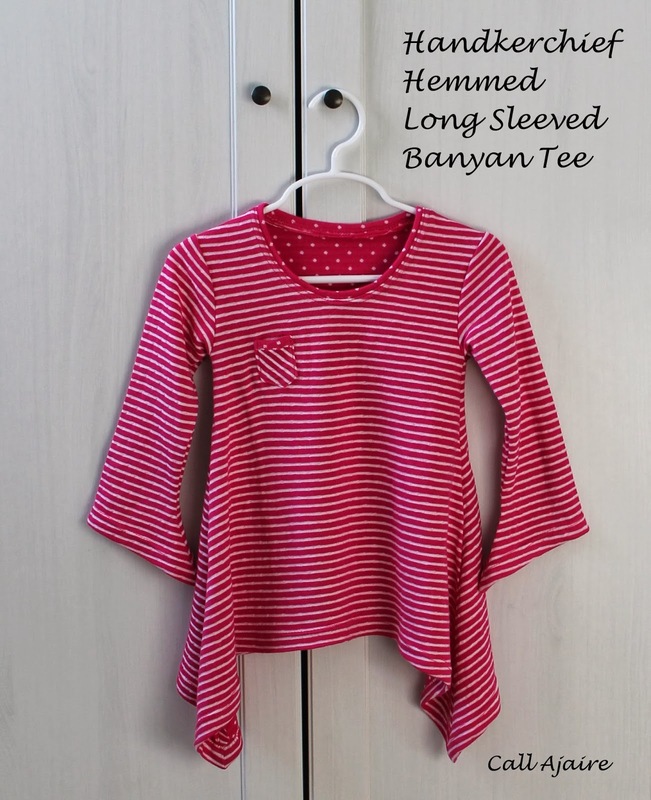 The double layer makes it a little thick which is be perfect for winter, but it makes the sleeve hems look like they hang a little funny on the hanger. Once Bean puts it on the drape is lovely (her arm takes some of the weight) and it is super snugly. The first Banyan tee I made is size 2/3 and the tee shirt length and it is starting to be a little too short and a bit snug across the chest. Even though the next size up is a 4/5 (!) I thought it would be good to cut out the larger size. I could have just made the 2/3 with the tunic length, but I was a bit worried about the chest and it would be amazing if this shirt could still be worn next fall. The fit is perfect. There is room to grow, but not so much that Bean is drowning in it. I really can’t believe my baby is fitting into a size 4 already. She won’t be 3 until May! 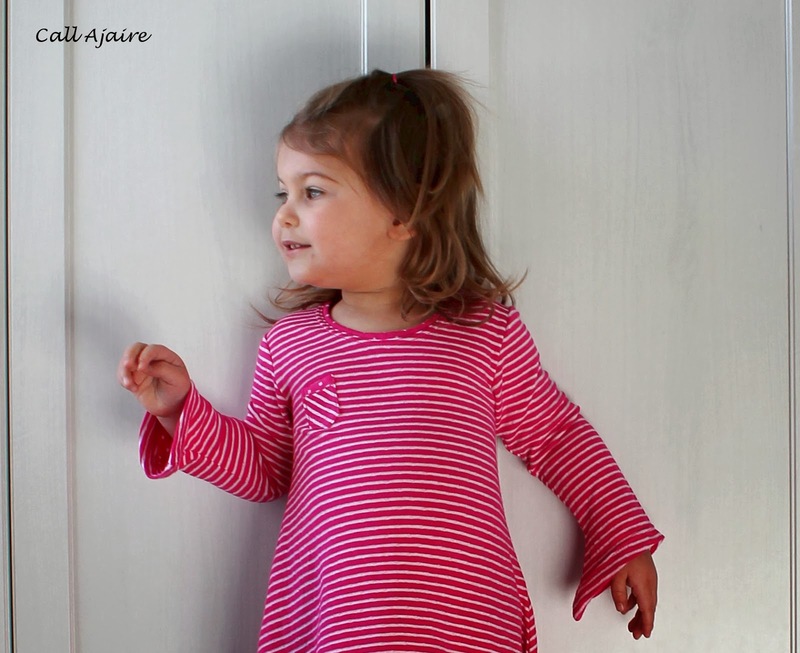 I made the sleeves using The Anywhere Dress (*affiliate link) long sleeve size 3T as a guide because A: I’m obsessed with that pattern and B: I just used it so I know the fit is good. Note: all of these “drawings” are not to scale. They are sketches of the pattern pieces and not the exact pieces so please do not try to just print them from these pictures. 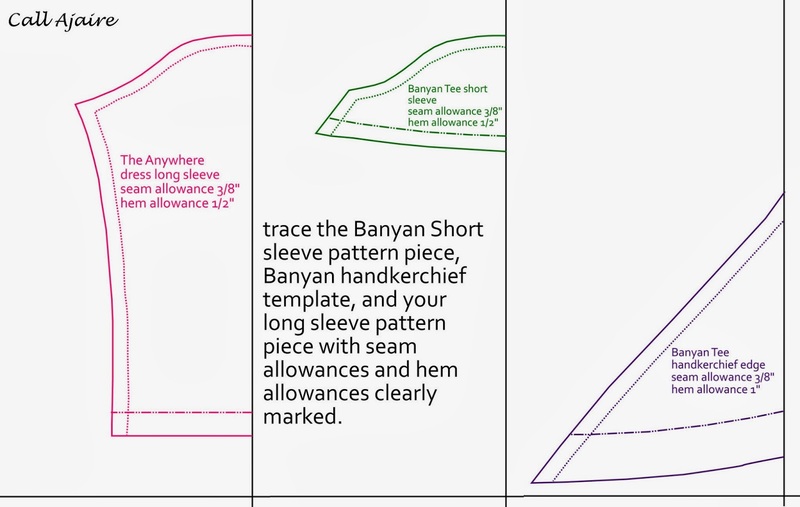 First choose the size you want to use for both the Banyan Tee and the sleeve. 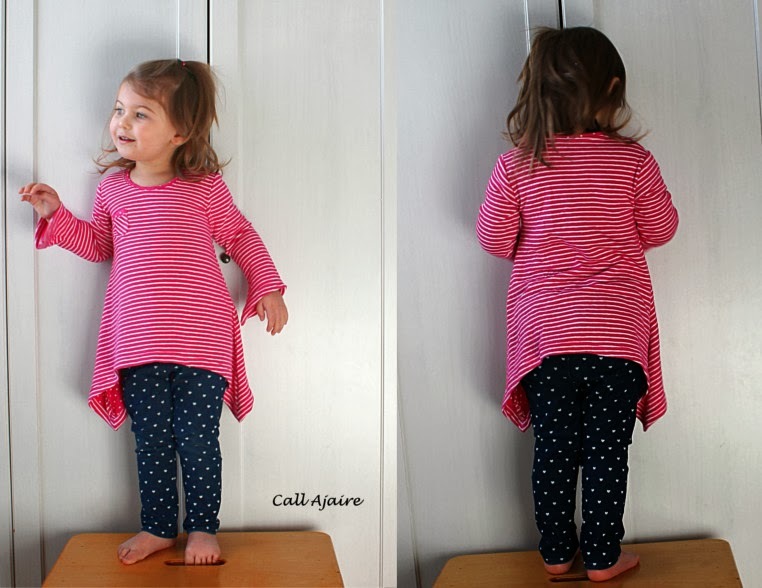 In my case I used the size 4/5 for the tee and size 3T for the sleeve length. It worked out well so don’t be afraid to mix and match. Step 1. In order to get that lovely handkerchief edge to mimic the hemline of the shirt you will take the front bodice pattern and cut it out (or trace it) to size. Cut 7 inches away and perpendicular to the front center edge. The purple section above is what you will need. Seven inches will work for any size Banyan you are making because the extra width comes from the seam allowance edge of the purple section. Step 3. Since the seam allowance of the Banyan sleeve is also 3/8″ this makes our work a bit easier. Either way you will line up the shoulder seam lines along the center grid line. Step 4. Now line up the handkerchief edge and sleeve hem seam lines along the center grid line. 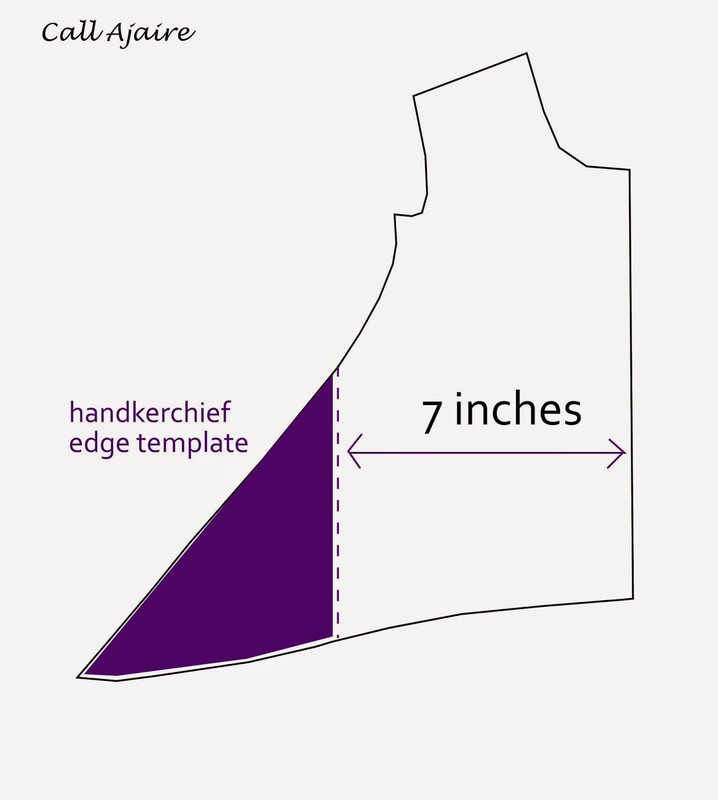 The hem allowance of the handkerchief edge is 1″ which is why you see a difference in the picture above. You must align the seam edge and not the cutting edge in order for everything to work correctly. Step 5. Here is where all the magic happens. 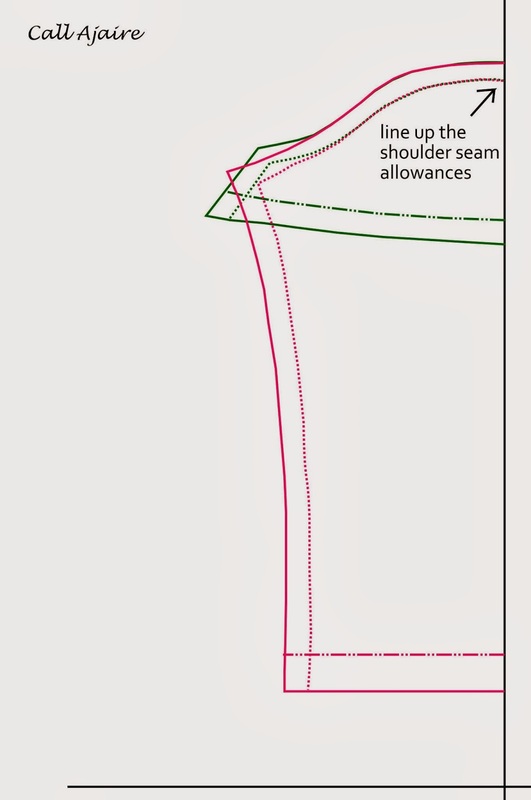 Starting at the shoulder edge you will trace the seam line (inner edge of the seam allowance) of the Banyan sleeve (green dotted line) all the way to the under arm seam. This is important since you want the sleeve to fit to the bodice correctly later. 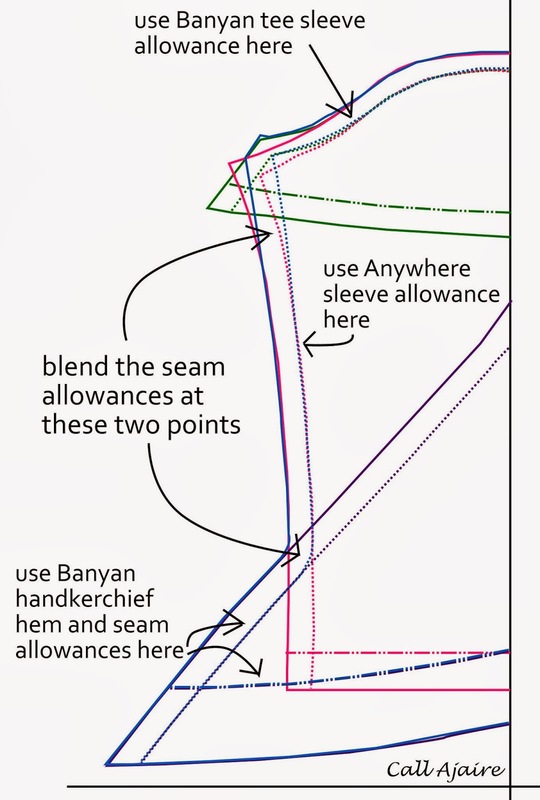 From this point you will blend the seam down to your sleeve seam line (pink dotted line) stopping just above the point where the handkerchief edge sticks out (purple dotted line). 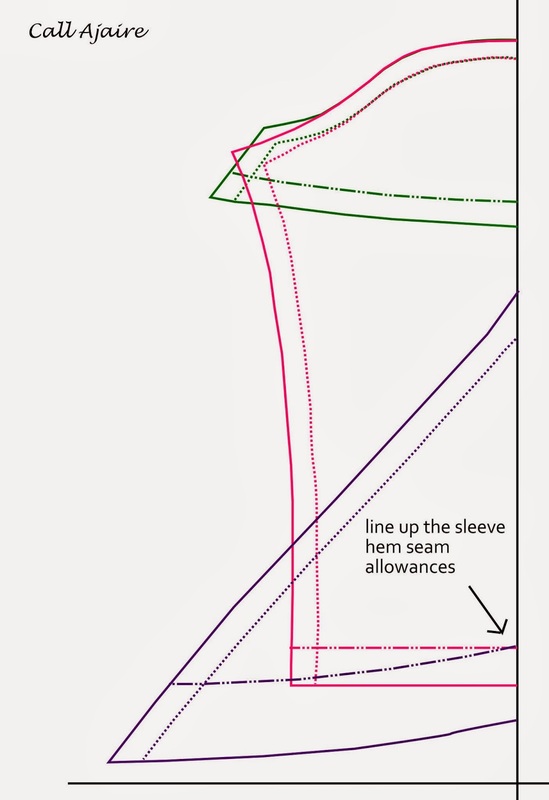 Then blend that edge and follow the handkerchief seam line down to the handkerchief hem allowance line (purple dashed line). Trace the handkerchief hem line over to the center grid line. You now have your pattern piece. Add the seam allowances and hemline (blue solid lines) to the pattern you just made (blue dotted/dashed lines) and you are ready to go. 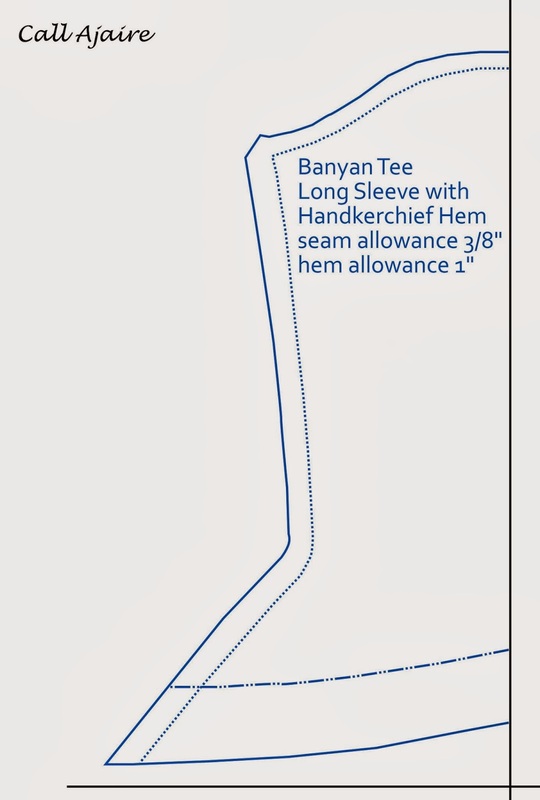 The new sleeve hem allowance should be 1″ to match the Banyan Tee hemline and the seam allowance should be 3/8″ to match the rest of the Banyan pattern and to make it easier to remember when assembling the shirt later. Cut two of the new long sleeve pattern pieces on the fold and follow the pattern instructions to attach the sleeve to the bodice. Once it’s time to hem the sleeve simply follow the pattern instructions for hemming the handkerchief edge of the bodice and you’ll have a perfectly pointed hem. Bean is almost as in love with this new shirt as I am. She insisted on wearing it to bed the first night and it looked so cozy I couldn’t say no. She’s wearing it again today too! This seems to be her favorite pose lately which just cracks me up. Where did she even see someone do this? It makes her laugh though so at least we can get some decent pictures, hehe. 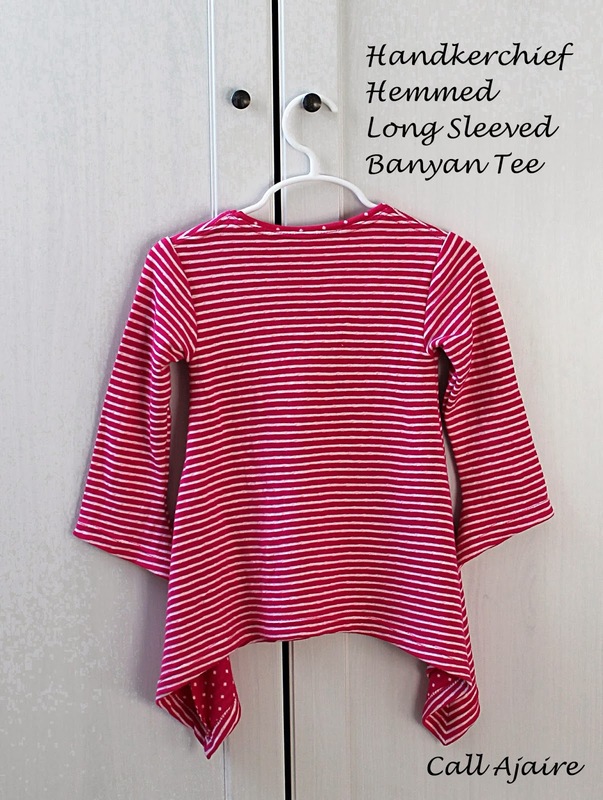 You can purchase the Banyan Tee at Go To Patterns (*affiliate link) so buy it quick while their New Year’s sale (*affiliate link) is still going on. Also, If you’re curious about her pants you can read about them here. So what else is on your KCW list? Let me know if you have any questions about the tutorial. I’m off to finish my KCW planning. What a cute sleeve! We love how the sleeve hem mimics the hem on the shirt. Great job. You know her biggest thrill in this is that she gets to stand on the bench! Taboo! That is so cool! Thanks for the tutorial. We're going to have to make one! A very well done tutorial!! Great work! I love it. She's got that modeling thing down!!! In both the blue sweater outfit and the shirt she looks like some one said, 'okay turn this way, now turn back that way'!! too funny!! 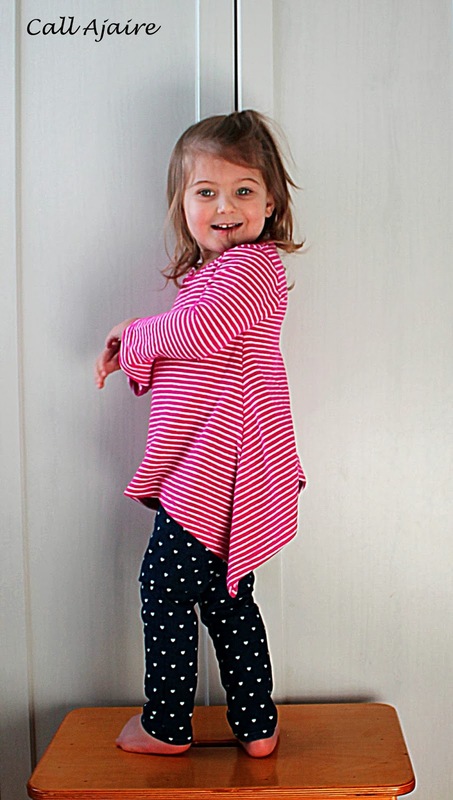 Great tut, and another adorable wardrobe staple for Bean! Your graphics are awesome too:) thank you!